Car’s Out of the Ditch; What’s Left of It Anyway! Realistically, it doesn’t look like anyone’s going to be driving this car ever again, so the highway that it’s on is irrelevant. And as far as what they’re sipping on, why that would be Kool-Aid. It looks like we’re going to need a new car, or perhaps just a new President, one who knows something about restoration. What in the heck is a government investment? I mean has anybody ever attempted to figure out what kind of return the government is getting on its current “investments”? 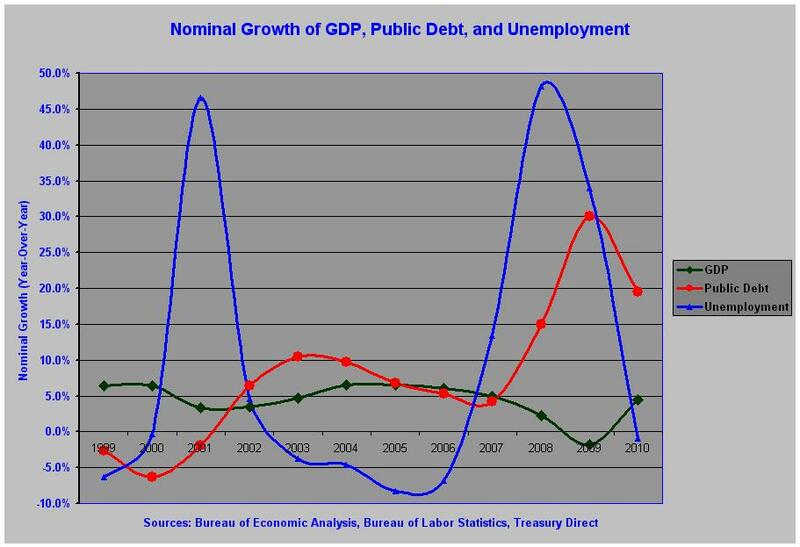 I find it rather alarming when I compare the nominal rates of change in GDP, Unemployment, and the Public Debt during the recessions of 2001 and 2008. For example, we see that in 2001, while the number of unemployed Americans increased by 46.6%, GDP was still growing, and the Public Debt was still shrinking. Then in 2002, the second year after the recession, the number of unemployed only grew by another 4.6%, with a modest increase in the Public Debt of 6.4%. And in 2003, the third year post-recession, the Public Debt increased by 10.4%, while the number of unemployed dropped by -3.7%. Unemployment continued to decline in each subsequent year until the beginning stages of the financial crisis appeared, near the end of 2007. In 2007 the number of unemployed Americans rose by 13.4% with modest changes in both the Public Debt and GDP. Following is the question of the day from @danlothiancnn, and then we’ll compare the periods of 2001 through 2003, with 2008 through 2010. The following statistics are drawn from the table and chart above. 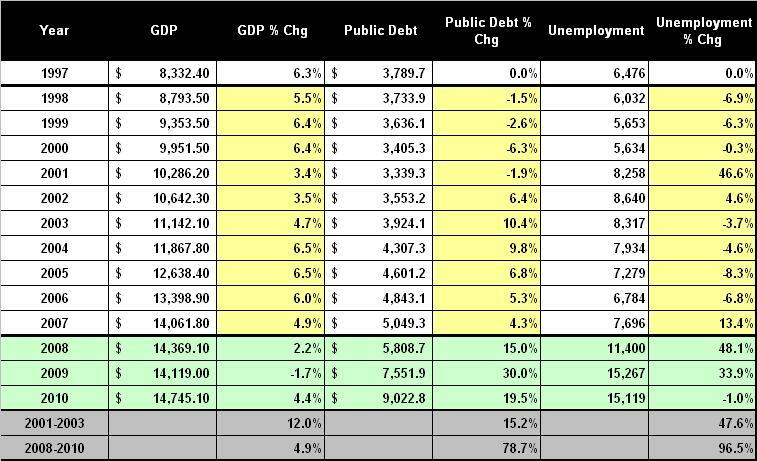 We are comparing nominal figures of the number of unemployed, gross domestic product, and the public debt. The percentages shown represent the rate of change from one year to the next. In 2001, the increase in the number of unemployed was 46.6%, or nearly the same as the 48.1% increase in 2008. In 2001, GDP growth was positive at 3.4%, versus an increase of just 2.2% in 2008. The biggest difference was that the public debt decreased by -1.9% in 2001, versus an increase of 15.0% in 2008. Moving into the year after the recession began, we notice a huge difference in the number of unemployed. In 2002, the number of unemployed increased by just 4.6%, while in 2009 the increase was a whopping 33.9%. You will also note that GDP increased by 3.5% in 2002, versus a decline of -1.7% in 2009. Next, you will note that while the public debt increased by just 6.4% in 2002, the increase in 2009 was an astronomical 30.0%. What this indicates is that the government overacted in 2009 by implementing a barrage of stimulus, regulations, and bailouts which did little more than increase unemployment and slow economic growth. Now let’s look at the 3rd year after the beginning of each recession. In 2003 the number of unemployed declined by -3.7%, versus a decline of just -1.0% in 2010. GDP grew by 4.7% in 2003, versus an increase of 4.4% in 2010. Meanwhile, the public debt grew by 10.4% in 2003, versus an increase of 19.5% in 2010. GDP was elevated by 12.0% in 2001-2003, while increasing by just 4.9% in 2008-2010. The Public Debt grew by 15.2% in 2001-2003, versus an escalation of 78.7% in 2008-2010. The number of the unemployed increased by 47.6% in 2001-2003, compared to mushrooming by 96.5% in 2008-2010. There is no such thing as government investment. In spite of the government’s colossal spending campaign, which over the past three years has increased the public debt by 78.7%, in the end, the number of unemployed Americans expanded by an absurd 96.5%, and gross domestic product grew by just 4.9% (the same that was achieved in the single year of 2007). So it looks like the federal government’s return on investment over the past three years has been negative. All we got out of the deal was a ballooning of the public debt by 78.7%, and a gargantuan uptick of 96.5% in the number of unemployed Americans. So much for that theory. Government investment amounts to nothing more than meaningless rhetoric. Perhaps it’s time for the government to get in the back seat; what’s left of it anyway. (1) Stop spending money that you don’t have, under the guise of making “investments”. (2) While you’re at it, you can stop playing God; enough with over-regulation. (3) And further, you guys can stop patting yourselves on the backs, because so far you have achieved nothing (nada). 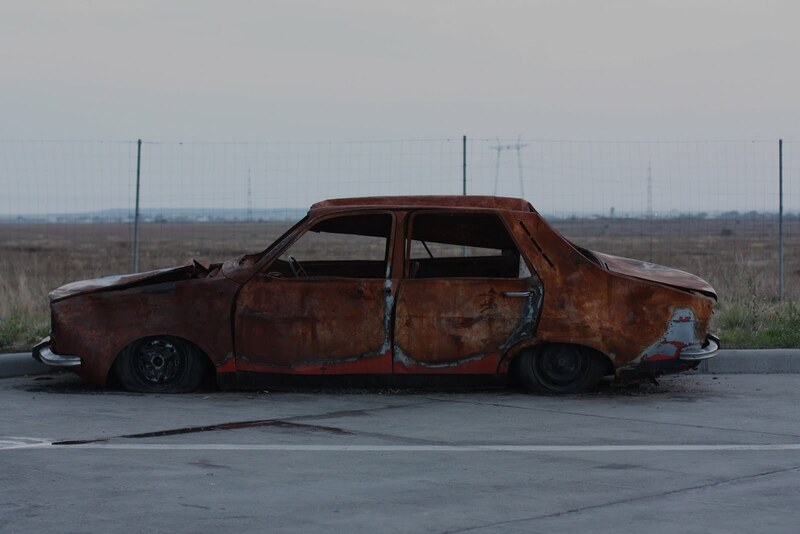 The car wasn’t in that bad a shape when Obama took the keys. The policies which Obama, Pelosi, and Reid implemented in 2009 are directly responsible for expanding both the number of unemployed, and the amount of public debt. Now that the car has been totalled, good luck with the C.Y.A. campaign.